In collaboration with Auburn University students, faculty, and staff, the Provost's Office charged a Steering Committee comprised of students, faculty, staff, and alumni with conducting a comprehensive study of the climate for diversity at Auburn University. The overarching goal of the study was to provide a foundation for establishing and maintaining a culture of equity, diversity, and inclusiveness that is embedded throughout the university. Identify current equity, inclusion, and diversity strategies and goals across the University. Gather input regarding the current culture of equity, diversity, and inclusion. Identify equity, diversity, and inclusion barriers frequently faced by students, faculty, and staff. Address strategies for strategically increasing these values across all departments and units. Assess the University's ability to recruit, admit and retain undergraduate and graduate students from diverse backgrounds across all academic programs. Assess the University's ability to recruit, hire, and retain faculty, staff, and administrators from diverse backgrounds across all units. Provide an historical context for the role of inclusion, equity and diversity at Auburn. Assess their role in Auburn's academic and co-curricular experience. Identify the current institutional process for reporting, responding and preventing bias-related incidents and microagressions. Provide metrics for evaluating and assessing the culture of equity, diversity, and inclusion progress and status. Advice to the University leadership on the implementation of the Committee's recommended actions. Identification of specific concerns raised by key stakeholder groups. Strategies foe strengthening existing campus initiatives and the identification of new ones designed to advance the University's inclusion goals. 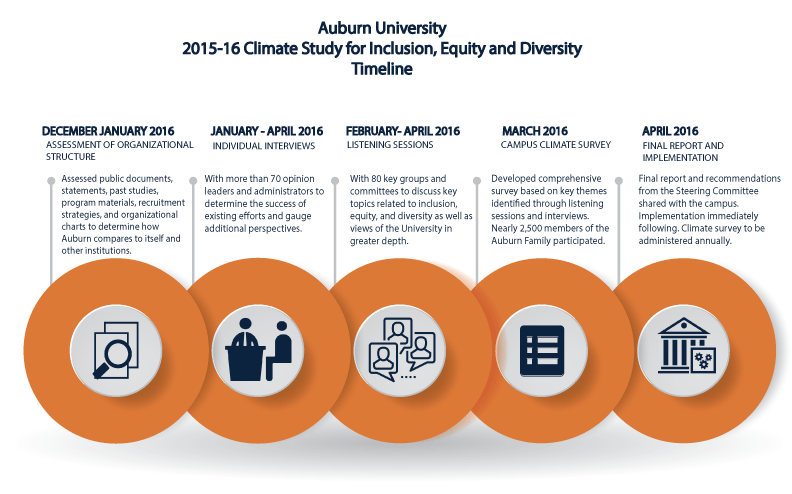 Comprehensive assessment plans for the ongoing measurement of diversity and inclusion as part of the campus environment at Auburn University.